If you think pork chops are only good for roasting, it may be surprising to learn there are other excellent ways to prepare them. Check out these delicious pork chop recipes and you won't believe how versatile the cut of meat can be. We bet you'll find something the whole family will love. 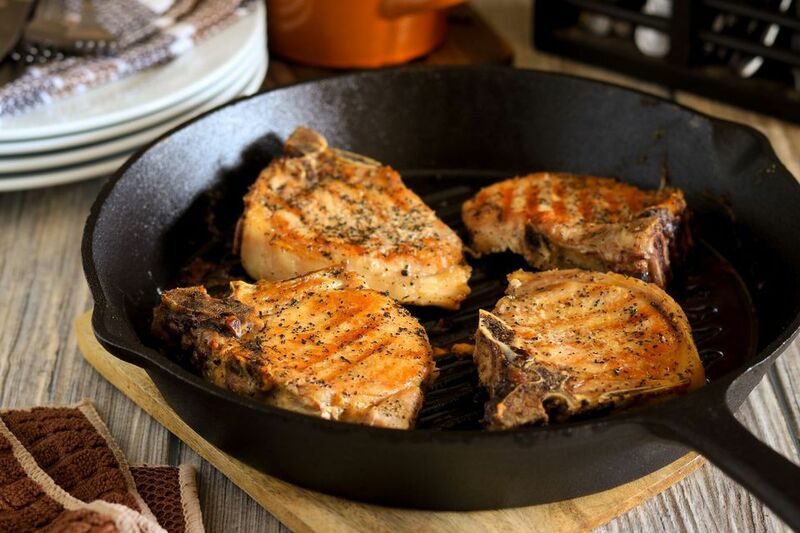 Break out your cast iron skillet for these versatile oven-roasted pork chops. Adding apples, pears, onions, or some combination thereof contributes a sweetness that pairs perfectly with the chops. You can use either bone-in or boneless chops for this recipe as well. Once you master the technique, feel free to get creative! Braising these pork chops allows the vinegar, mustard, Worcestershire, and brown sugar mixture to marinate the meat into tenderness. While it takes about an hour for the chops to finish, these need only a few minutes of active cook time, so they still make a simple weekday meal. Go south of the border with these pork chops. Tomatoes and green chiles give these shoulder chops a little kick and they don't even require turning on the oven. Add a little more chili powder for additional heat or go scant on it for a milder version. This stovetop recipe makes tender, succulent pork chops that you can dress with barbecue sauce for an easy, quick dinner that's also gluten free. Use bottled sauce to keep it simple or whip up your own for a fully homemade meal. Set it and forget it until suppertime with this easy slow cooker recipe. The juices combine while everything cooks to make a delicious sauce that you can simmer on the stovetop to your preferred thickness. Serve them alongside mashed potatoes, rice, and your family's favorite veggies. Paprika adds a smoky, slightly spicy flavor to mild pork chops without much effort. You may think of paprika as the bright red powder in your cabinet, but there are actually many kinds, from mild to bittersweet, smoked, and more. Try different varieties to discover the versatility you can make with just one shaker. This recipe tastes especially delicious with a sweet accompaniment like mango chutney or fruit salsa. These glazed maple chops taste wonderful with the darkest grade syrup you can find. We're not talking Mrs. Butterworth's here—stick to the real stuff. While the recipe calls for Creole mustard, any whole-grain mustard will work well, too. The key to glazing pork chops on the grill is keeping an eye on it so the sugar in the sauce doesn't burn. Soy, rice vinegar, brown sugar, and garlic creates a teriyaki sauce that will have you going back for seconds. While these chops work well on the grill, you can also make them in a skillet or the oven. Hash browns for dinner? You bet! This homey casserole uses frozen hash browns and French fried onions to pump up center-cut pork chops to make a one-dish meal that will satisfy the entire family. Add broccoli or peas for a little greenery. The addition of just a little curry powder gives these breaded and fried chops a nice little kick. If you don't like broccoli, feel free to substitute any other green vegetable you enjoy. Searing these pork chops before cooking them through in the oven prevents the lost of juices. That helps keep them nice and tender while you raise the interior temperature to a safe level. Once you master the technique, add whatever spices or sauce you like best. Brining these pork chops first keeps them juicy while they pan roast in the oven. Adding caramelized onions imparts a lovely sweetness that complements the meat perfectly. Serve them alongside rice or potatoes to soak up all those luscious juices. Get a taste of the Bayou with these smothered pork chops made with chopped vegetables and spices. These are perfect for a Mardi Gras meal or any time you want to enjoy a hint of Southern flavor. They're great by themselves or with macaroni and cheese for extra substance. What's better than pork chops for dinner? Pork with bacon. These skillet chops with a simple dijon cream sauce are easy enough for a weekday meal, but look good enough for guests. Bacon adds a nice smoky element to the dish that contrasts well with the cream sauce. Use pork loin chops for this quick-cooking method since they won't be on the heat long enough for tougher cuts to become tender. The peppers bring a bright color and sharp flavor to the dish, but you can also use green beans, asparagus, or even zucchini in addition or as a substitution. For a nice change, this recipe can also be made with boneless chicken breasts. With condensed soup and canned mushrooms, this easy pork chop dish can come together with ingredients you may already have in your pantry and goes easy on the wallet. You can also add sliced celery and onions for extra flavor and texture. Fire up the grill for these marinated pork chops, so you can put a great meal on the table while keeping the kitchen cool. A little planning ahead is required—the chops marinate in soy sauce, mustard, and a little brown sugar for at least 30 minutes and up to eight hours. Toss together a salad or throw some vegetables on the grill for a well-rounded meal. Sweet and citrusy orange juice and marmalade go great with pork and these glazed chops are ideal for a family meal or a dinner party. Simmer them in the juices until they reach a safe temperature and pair them with potatoes or rice to round it out. Thicker chops will come out juicier, so ask your butcher to slice them to about an inch in thickness. This two-ingredient baked pork chop comes together quickly for a weekday meal that takes under an hour. Use tart apples like Granny Smiths that have a firm texture, so they won't turn into mush in the oven. You can also add onions and garlic or potatoes for a slightly different flavor or to turn it into a one-dish meal. Don't scoff at the cream of potato soup in this baked pork chop recipe. It gives them a meaty, creamy flavor and velvety texture you'll find addictive. If you prefer, use cream of mushroom or even Alfredo sauce instead. Center-cut or "American cut" pork chops are meaty and boneless, but you can use pork loin or another variety, too. Parboiled rice works best in this slow cooker recipe. Check the rice after four hours to ensure it doesn't get too soft. You can also use wild rice or a mixture for a slightly different texture. Feel free to add green peas or other vegetables or mix up the flavor profile to suit your tastes. A bottle of ranch dressing is all you need for these tender and simple marinated pork chops. Just marinate for 30 minute and up to eight hours, and then put these on the grill for a meal that couldn't be easier. Pair these with a green salad, salt potatoes, or your favorite veggies. These stuffed pork chops work beautifully for a dinner party with their impressive presentation and crowd-pleasing flavor profile. Stuffed with an apple, pecan, and breadcrumb mixture, they have a sweet and savory balance that your guests will love. Add a simple grain or potato side dish and some steamed vegetables to bring it all together. When you've got a craving for ham, but want something a little different, these smoked pork chops save the day. Buy them fully-cooked and toss them under the broiler, on to the grill, or even use a skillet for just 10 to 15 minutes. They don't need much seasoning, but you can serve them with a glaze or a sauce like you would a ham steak. 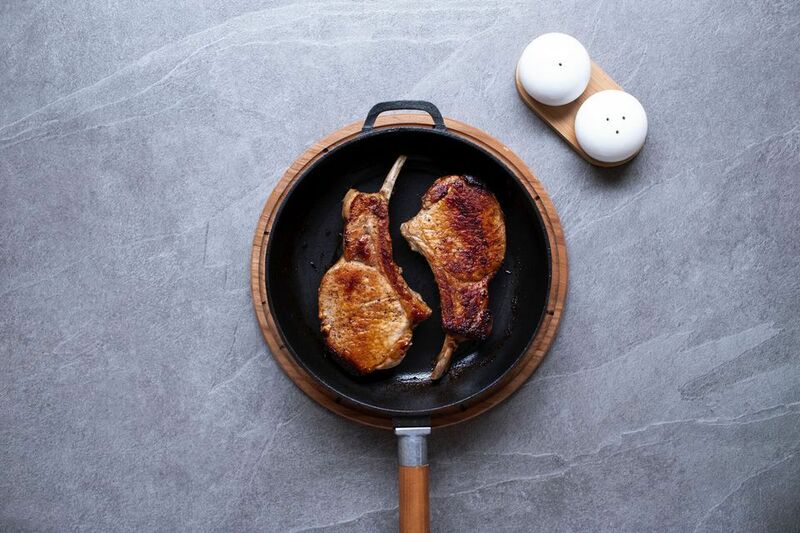 Make these classic fried pork chops by dipping them in an egg wash, milk, and flour before frying until golden. To keep your hands clean, use the "two-hand method." Dip the chops in the milk and egg with hand, then transfer them into the other hand to dredge in the flour. A simple cream gravy completes the package. Topping pork chops with diced fruit is both delicious and beautiful. While this recipe calls for apples and cranberries, they go well with pears, peaches, or just about any fruit you prefer. Add chopped walnuts or pecans for a little texture. If you can't find fresh or frozen cranberries, canned cranberry sauce works, too. Enjoy the Italian flavors of this dish with zucchini, tomatoes, and Mozzarella cheese, which all comes together right on the stovetop. Adjust the amount of chili powder to make it more or less spicy, according to your tastes. Both boneless and bone-in pork chops will work in this one-pot wonder. Inspired by the state of Alabama, this budget-friendly recipe uses ingredients you probably already have on hand. Tomatoes, garlic, and thyme give it a nice, mild flavor. Feel free to add rosemary, fennel, basil, or oregano to mix it up a bit. The dish also tastes great with Louisiana or Creole seasonings. This easy baked pork chop makes a great one-dish meal, but you can add a side of potatoes or vegetables for extra heft. Apples add a nice sweetness, but you can use pears or even dried fruit like raisins to add additional interest. Use pre-seasoned herb stuffing mix or tear up bread that's going stale for the stuffing. If you use your own bread, toss in your own thyme, rosemary, oregano, or fennel for flavoring. Heat things up with these spice-rubbed pork chops that can be broiled or pan-grilled for a nice crust that keeps the juices inside. Chipotle, chili powder, and Creole seasoning give them a hearty kick, which you can adjust to suit your individual tastes. Add a green salad or your preferred vegetables to make a whole meal. If you're used to serving bread beside your meat, why not stuff your pork chops with it? This hearty cornbread-stuffed recipe will impress your guests with a flavor profile that tastes like Thanksgiving. Use your favorite dried fruits to mix it up and opt for nice, thick chops so they stay nice and tender. Sweet apricot preserves and tangy balsamic vinegar give these glazed chops a succulent flavor that pairs perfectly with potatoes, rice, or pasta. If you can't find apricot preserves, this recipe also works with other types of fruit. There's no need to heat up the oven for this skillet meal—even an inexperienced cook can pull together in a snap. A creamy, herb-studded Boursin cheese sauce pumps these skillet pork chops up a notch. A little wine gives it a deeper, more complex flavor, but you can use chicken broth instead if you prefer not to cook with wine. While the recipe calls for boneless pork chops, you can use whatever cut you like best, but know the cook time will vary. You won't believe the flavor that ginger ale and ketchup lends to these simple baked chops. The slightly sweet sauce thickens as they bake and you can also use barbecue sauce or add red pepper flakes for a spicier, smokier flavor. These chops taste great over rice or with a side of potatoes or pasta and a steamed vegetable. Tangy sauerkraut and pork chops will transport you to Germany with this hearty supper dish. Add sliced apples or make your own applesauce for sweetness and some matchstick carrots and sliced onions to punch up the flavor. Caraway seeds add spice and authenticity, but you can leave them out if you don't like anise, or slice in a fennel bulb to increase that element. Neither pork chops nor prosciutto are all that fatty, but combine the two to keep the chops juicy and tender and make a dinner that looks like more work than it really is. You can also cook these chops in the oven if you don't want to fire up the grill. Kids and guests alike will love it. Soy sauce and pineapple are a match made in tropical heaven with this grilled recipe. Marinate both the meat and the pineapple slices in soy sauce, onion, garlic, and a little brown sugar to infuse them both with sweet and salty flavor. Allow about two hours for marinating before grilling up this dynamic duo. Make a sauce with sun-dried tomatoes, chicken stock, wine, and milk to blend with butterflied grilled or skillet-roasted pork chops and serve over pasta. While this dish is easy enough to toss together on a weeknight, the depth of flavor is complex enough to serve to guests, too. Kids and adults alike with both ask for seconds.